At least half of this course is delivered inside Anki, an app for your computer/phone/tablet. It allows for audio files. Pretty important for ear training. It monitors your progress and adjusts itself accordingly. You’re awesome at intervals, but struggle with chords? 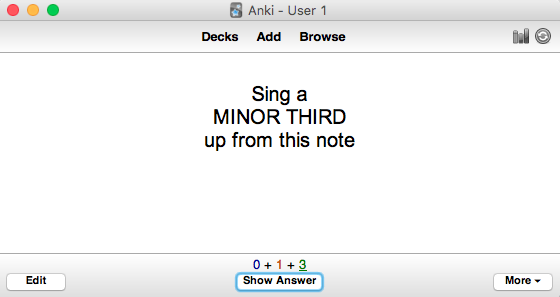 Then Anki will adjust to show you cards for chords more often, while slowly phasing out the cards for intervals. It’s built to help people memorize huge data sets. Like doctors learning diseases and medications, travelers picking up new languages, or musicians internalizing music theory. Of course ear training isn’t just information to be memorized—it’s having the ability to discern subtleties that aren’t obvious to non-experts. But the flashcard method still holds, and the technology of the app provides a convenient way to organize, disseminate, and study the material. How much does Anki cost? Anki is free, with one exception: the iOS app. That version pays for the development on every other platform, so it’s a steep $25. I love the iOS app, but you probably don’t need it. You can study on your computer, on the web, and on a bewildering array of other devices (Linux anyone?). Because the course is designed to only take 5 ish minutes of your day, you can probably find a time to study from your computer. And if you find that you do need the iOS app? It’s totally worth it. Personally, I travel a ton, and being able to study in a hotel room or tour bus or green room is a godsend. How do I set up Anki? Go to https://apps.ankiweb.net/ and download the appropriate version(s) of the program. The rest of the settings work on a deck-by-deck basis, so go ahead and download the first deck here. Double-click on the file to open it in Anki. Click that little gear icon and then click Options. How do I use Anki? It should auto-play the cue sounds. Give your answer (which might be singing a note or might be naming an interval, depending on the deck), then “flip” the card over by clicking Show Answer, hitting the space bar, or tapping the screen. For decks with audio answers, it’ll autoplay the answer too. If you need to hear the cue again before flipping the card, type “r” on your computer or click the “play” icon on your mobile device. Again if you got it wrong. Hard if you sang it way out of tune or needed to perform some mental gymnastics to come up with the answer. Good if you got it right. Easy you should probably avoid unless you’re so damned good that you’re 100% certain you’ll never need any more practice on this question. Study until you run out of cards. If you have a bunch more time available for studying, move on to the next lesson and/or deck. Try not to get too aggressive with starting new decks—it can be pretty discouraging to open the app and find 15 or 20 minutes worth of work waiting for you. This might seem a little overwhelming from looking at these screen shots, but within a day or two you’ll feel right at home inside the Anki app. Things not working quite right with Anki? Double check that Show in random order, New cards/day, and Automatically play audio are right. Sometimes people have to change a setting, save it, change it back, and then re-save it. Rare, but it happens. If the app isn’t autoplaying the audio, it’s probably because your headphones aren’t plugged in/paired. You can also click the play button each time, but it feels laborious (and the sound coming out of those tiny speakers on your device isn’t doing you any favors either). Once you’re pretty deep into the course, you’ll get a warning message saying that you have too many decks. You can dismiss it. We’re using the app sort of off-label, and in theory it’ll start to slow down as you add lots of decks. If you do experience that slow down, just delete the early decks (that are probably not showing you many cards at this point anyway). If these things don’t fix the problem, email me at [email protected] with your circumstances and I’ll troubleshoot it with you. Anki is crazy powerful and can feel overwhelming if you read the manual. Rest assured that you’ll get 95+% of the benefit from what’s in this lesson.